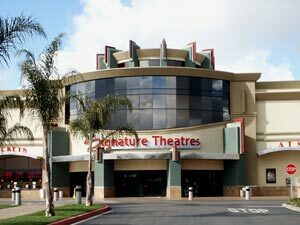 Escondido's beautiful 16-screen stadium and IMAX is located in the Signature Pavilion, which is in the heart of Downtown Escondido at Escondido Boulevard and Valley Parkway just across the street from California Center for the Arts, Escondido. The theatre is surrounded by a variety of restaurants and eateries, and within walking distance of other fine Downtown restaurants, art galleries, antique stores, and Escondido Children's Museum. Signature Theatre eateries include: Fatburgers, Signature Bagel & Deli, Starbucks, Juice It Up, and Hichizuki Japanese Restaurant. Go to the movies and spend the day, afternoon or evening in Downtown Escondido. It's a warm and wonderful place to be. For a current listing of theater showtimes or to purchase tickets, visit www.fandango.com.